I was planning on making another lengthy Merckx Mondays post today, but got caught up in the previous post, so It’ll have to wait until next week. 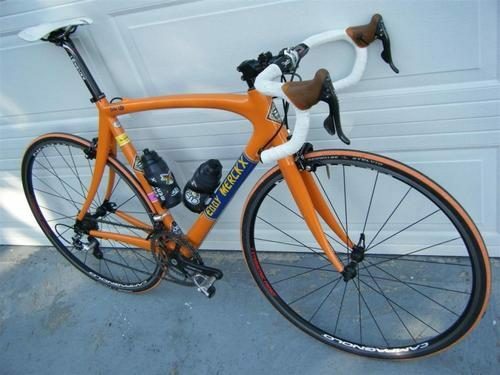 As a point of departure from my normal vintage language, today I’m posting a special 2006 Carbon Fiber AXM road bike. This roadie comes from Yippin Yahoo on Velospace with a nice little back-story attached to it. 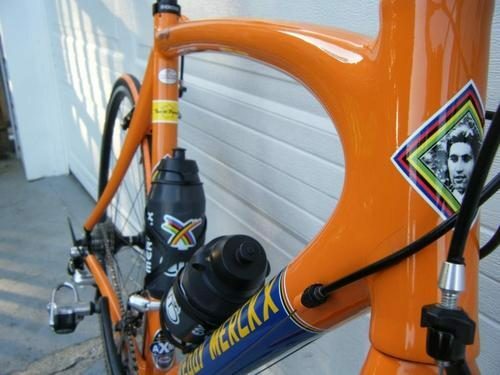 The owner says he was fitted for this bike in Belgium by by Frans Mintjens, a former teammate of Eddy Merckx. After the fitting, Frans called the EM factory and arranged for them to do a custom Molteni paint job for the bike. The end product is pretty legit and I’m not usually a fan of high-end road bikes. He has hopes of meeting the Cannibal one day and getting his autograph on the top tube. Like most high-end road bikes, the owners usually feel some sort of unnecessary obligation to keep the bikes in pristine condition, but he’s already put 4,400 miles on it, so it’s getting ridden! Check out some more shots and the complete build list over at the Velospace page.